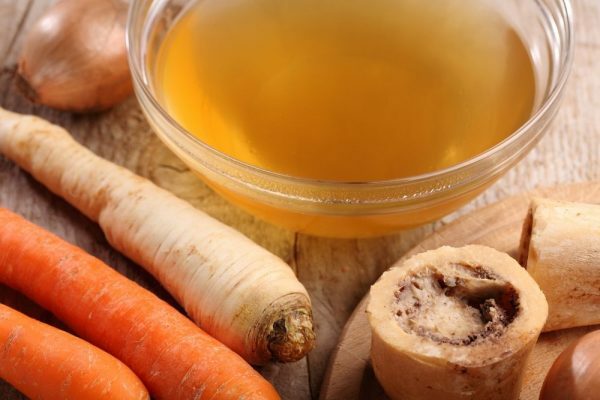 Bone broth has been used medicinally for centuries. This healing super food is the perfect staple to help you heal from Adrenal Fatigue. Bone broth promotes sleep and calms the mind. It heals leaky gut and fights infections like flu and cold. It’s also a great source of gelatin, collagen and minerals that are easily absorbed by the body. This recipe is ideal for making in batches as it stores well in the refrigerator for easy use. Please make sure to use grass-fed beef bones. Put bones in roasting pan or on a single layer on a sheet. Drizzle over with coconut oil or olive oil and roast for 30 minutes. Then flip over each bone and roast for an additional 30 minutes. While the bones are roasted chop the vegetables. Place roasted bones, vinegar, vegetables, bay leaf, peppercorns, real salt, and garlic (if using) in a large soup pot. Cover completely with 10 cups of water and bring to a high simmer. Once there is a high simmer, reduce the heat to low and let the broth simmer for 12-24 hours. Throughout simmering, add more water as needed so that all the ingredients keep submerged. Remove from heat once the broth has reached a dark, rich brown colour. Discard the bones, vegetables and bay leaf and strain through a cheesecloth. Let the soup pot cool to room temperature. Once room temperature is reached pour into jars and let cool in the refrigerator for at least 1 hour. When you are ready to serve, remove the condensed fat off the surface of the broth and heat to the desired temperature. Like this recipe? The Adrenal Fatigue Recovery Package contains more than 100 straightforward, nutrient-dense, and tasty recipes. A 14-day Mealplanner and a handy Shopping List. It also contains specific dietary guidelines and many other dietary tips that will help you recover from Adrenal Fatigue. thanks for the feedback Liz!